In a crowded game, the tie breaking privilege of the Iron Throne can have a great deal of sway over people’s positions on the influence tracks, and as a result your subjects will often offer favours and loyalty in exchange for a position above their neighbour. It also gives you a stranglehold on the throne for as long as you can equal the highest bid (this fact will deter people from making extravagant bids for the throne unless they really need it). Moving first also gives you a huge advantage in raiding and counter-raiding. Your support and consolidate power orders are much safer and can be strewn about the map more liberally thanks to the throne. Baratheon starts to lose its lustre as he approaches his supply limit. If he has a good relationship with Stark, the adjacency of Mountains of the Moon to Crackclaw Point gives him a much needed extra barrel, and for that reason it may be wiser in general to align with Stark rather than Martell, as the latter’s frontline is relatively barren and easily retaken. If Baratheon is close to winning he may find himself fighting on several fronts, and hence requires plenty of barrels to keep the enemy at bay. Relations with Lannister can be a little sketchy, as minor trespasses will usually be forgiven and forgotten in order to focus on the much bigger threats coming from north and south. However, seizing Harrenhal may result in retribution from the enormous mustering centres of adjacent Riverrun and nearby Lannisport. It is more practical, therefore, to engage Lannister on the plains of Blackwater where they are less formidable. Some players rush to King’s Landing as early as turn 1 in the hopes of seeing a mustering or game of thrones card in the following Westeros phase. This is a reckless move because it sacrifices map control and an opportunity to gain power from Kingswood and a strong mustering position in Dragonstone. The taking of KL should not be left too late, however, as it is a prime place to build a support core for taking and holding valuable locations such as The Reach and Blackwater (which alleviates Baratheon’s supply strain). The Baratheon navy serves two purposes: raiding against naval support from incoming Stark or Martell convoys, and supporting the key land locations from Blackwater Bay. Both the neighbouring navies are hard to break, and usually require special circumstances, such as the web of lies card, or a substantial tip of the house deck compositions in your favour, to be dislodged. 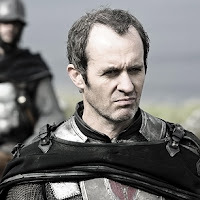 Storm's End can be a point of contention between Baratheon and Martell, and will probably be the earliest dispute in the game due to both factions' positions on the Iron Throne track. Without a major effort from Baratheon, Martell has the means to take and hold Storm's End for the first few turns due to their excellent support core in the Sea of Dorne and very threatening house deck. Picking a fight with Martell early on will put Baratheon in an incredibly vulnerable position, potentially losing his one position of power on the influence tracks by Doran and being decimated by the Red Viper's swords. Tyrel and Lannister don't occupy such a position of dominance over Baratheon in the opening turns, being lower on 2 out of 3 tracks, and as such make good early targets. The biggest threat on this route is the emergence of a southern or western alliance , so careful diplomacy and use of the Iron Throne will be crucial. The immediate Westeros coast is a pretty barren area, but Crackclaw Point gives valuable access to the prised Mountains of the Moon and King's Landing. The Knight should move here to get the land invasion rolling, while the footman can either remain on Dragonstone to consolidate power on turn 2 or stake an early claim on Storm's End if Martell is either unprepared or generous. The Baratheon navy is the main threat to his neighbours, and their primary concern should be to stop him from having a boat convoy between their two spheres of influence at the end of turn 1, since Iron Throne dominance will afford him a free attack on their squishy fledgling territories in turn 2. Assuming they prevent this, a move to Blackwater Bay is a good way to secure KL on turn 2, and set up Salador Sahn's defensive wall. The possibility of moving into The Reach is not overwhelmingly important, as this will tend to trigger southern aggression before Baratheon is ready for it. Scoring an extra 2 power tokens or strengthening an attack on Storm's End is more worthwhile and doesn't sacrifice control over Kingswood, the closest thing Baratheon has to a bread basket at this point. 4 Stannis: Very generic subpar 4-strength card, purely exists to boost Ser Davos. 3 Renly: Another weak card which is too predictable to be useful. 2 Brienne: Baratheon's shield, made slightly more useful than other sides' castle cards because of her higher combat strength and sword. 2 Ser Davos: Baratheon's reward for endurance, providing greatly needed strength and sword. 1 Melisandre: A surprisingly ill-conceived and predictable card due to her 1-strength counterpart's specialisation. 1 Salador Sahn: Keeps Shipbreaker Bay protected from just about any attack. 0 Patchface: An absolutely indispensible card which can protect you from your enemies' handy gimmick cards (Roose Bolton, Doran Martell) or castrate their most lethal commander (Red Viper, Gregor Clegane, Eddard Stark). Hey I've played the game a few times now and I was wondering what you meant by "Strength: Can hold the Iron Throne for the whole game if he wants to." Only played as Baratheon once but I've never seen this come into effect? Meaning: the power cost for people who are not on the iron throne is higher because the tie will always be broken in your favour. This tends to encourage people to maintain the status quo because they cannot afford to beat the iron throne holder, and even if they try to take it, Baratheon can technically always win the bid if he is collecting power at the same rate. Lannister is the hardest in my view, so I'm saving it until after I've done the others. lannister always seems to have INSTANT maximum supply in all the games i've played. I usually play as baratheon, and 90% of the time can maintain the iron throne the whole game AND max out power tokens halfway through the game. Now, we haven't played with more than 4 players, where i would assume tyrell and martell would be huge thorns in the baratheon strategy. Looking forward to playing this weekend though to see if they can deliver trouble. Good luck with your 6 player game, I think you will find it a different beast entirely, especially for Baratheon. Also, if your Lannister gets maximum supply, your Greyjoy might not be aggressive enough. Feel free to report back on how it goes, in my experience Baratheon gets creamed between Martell/Stark if he isn't careful. I own the 2nd edition and have played several times to find the lannisters useful in that 1) nobody wants to lose to the mountain that rides 2) tyrion can be used to thwart any other house cards effect and maybe someone else will suffer the consequences 3) they are within reach of everything 4) tywin's two power tokens can sway the bidding in your favor. I however, along with my fellow players, have tweaked the rules some to make it a faster paced and much more interesting game. I also think anything less than 5 players is a joke and you shouldn't waste your time. What variations have you made to make it work faster? Me and my friends have been trying to enact some, but most make it unbalanced.